The Labor Department’s Bureau of Labor Statistics released its jobs numbers for June this morning. CNS News posted the numbers. 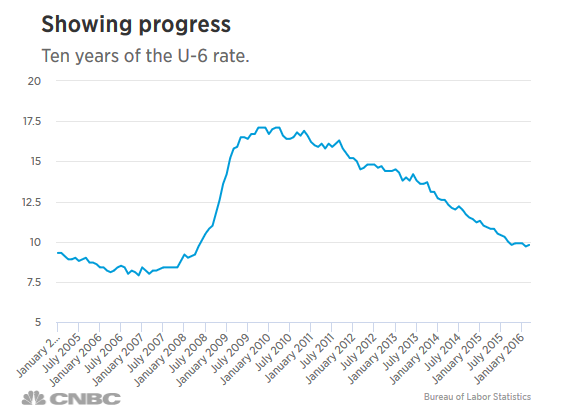 As you can see, the Labor Force Participation Rate is fairly steady and moving upward. The U.S. economy added 220,000 jobs in June, the best showing since February and well above analysts’ expectations of 174,000. There is still a lot that needs to be done to put Americans back to work, but we are moving in the right direction. Cutting back on federal regulations should help stimulate the economy, but that impact of cutting those regulations may not be immediately felt. President Trump has been in office for about two weeks. He has issued a number of executive orders that he believes will help restart the American economy, but he really hasn’t been in office long enough to see very much in terms of results. However, what he has done is increase optimism, which does influence the business climate. Yesterday the January jobs report was released. Hot Air posted a story. After accounting for the annual adjustments to the population controls, the civilian labor force increased by 584,000 in January, and the labor force participation rate rose by 0.2 percentage point to 62.9 percent. Total employment, as measured by the household survey, was up by 457,000 over the month, and the employment-population ratio edged up to 59.9 percent. …U.S. 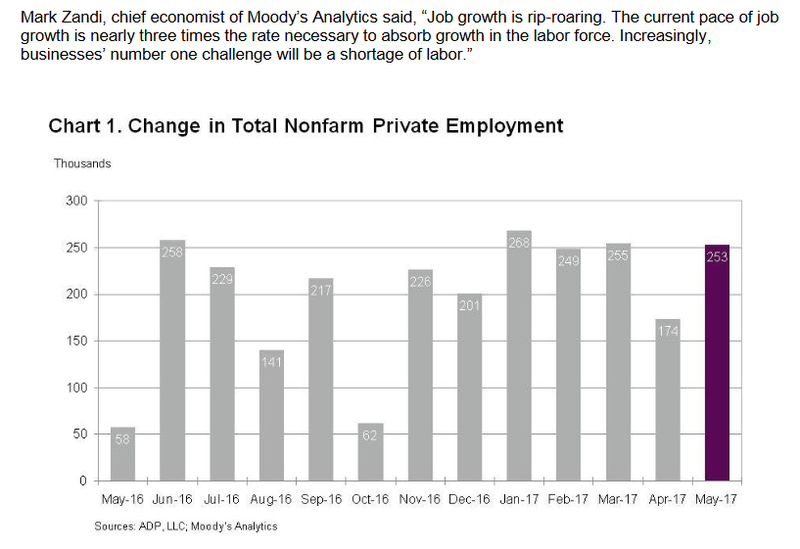 job growth surged more than expected in January as construction firms and retailers ramped up hiring, which likely gives the Trump administration a head start as it seeks to boost the economy and employment. Nonfarm payrolls increased by 227,000 jobs last month, the largest gain in four months, the Labor Department said on Friday. But the unemployment rate rose one-tenth of a percentage point to 4.8 percent and wages increased modestly, suggesting that there was still some slack in the labor market. It may be a slow climb, but we are at least moving in the right direction. Bloomberg.com paints a very rosy picture of the December jobs report. They note that the unemployment rate is 4.7 percent. The 156,000 increase in December payrolls followed a 204,000 rise in November that was bigger than previously estimated, a Labor Department report showed Friday in Washington. The median forecast in a Bloomberg survey of economists called for a 175,000 advance. The jobless rate ticked up to 4.7 percent as the labor force grew, and wages rose 2.9 percent from December 2015. Please note in the statistics below that the labor force participation rate rose by a tenth of a point–hardly enough to account for the uptick in the jobless rate. The economy is improving, but not currently at a rate that would indicate a recovery during the time that President Obama has been in office. Hopefully as regulations are removed and small businesses are encouraged to grow rather than facing more regulations if they grow, the economy will improve. However, to claim that President Obama presided over an economic recovery is to stretch the truth to the point where it breaks. The Obama Administration has proudly announced an unemployment rate of 4.6% for November 2016. That’s nice, but that isn’t the real story. CNS News posted a story yesterday explaining the 4.6 % number and using some other numbers to put that number in perspective. Although the “unemployment rate” in the United States for November is 4.6% — a rate last reached 9 years ago in August 2007 – the “real unemployment” rate is much higher, more than double at 9.3% nationwide. Real unemployment, or the U-6 number, as calculated by the Bureau of Labor Statistics (BLS) includes “total unemployed, plus all marginally attached workers” and part-time workers age 16 and over. While the unemployment rate for November 2016 was 9.3%, the last time it was at a level close to that, 9.2%, was in April 2008. From June 2008 through September 2015, the real unemployment rate was in double digits, fluctuating from 10.1% to a high of 17.1% and finally back down to 10.0% (in September 2015). The real unemployment rate has been in the 9’s since October 2015. 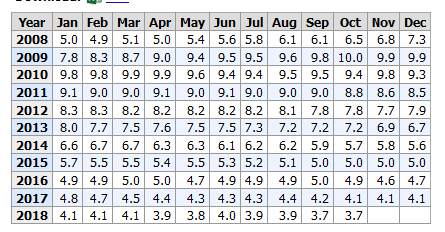 The 4.6% unemployment rate sounds wonderful, but since it does not include those Americans who are out of work and no longer looking for work, it is not a meaningful number. The American economy has not prospered under President Obama. Hopefully, putting a successful businessman in the White House will change the American economy for the better. A good statistician can make numbers say anything he wants them to say. The people currently working for the government are not good statisticians–they are great statisticians! We have all been told that the unemployment rate for Americans has dropped to 4.9 percent. Wow! That is wonderful. But wait a minute–let’s look a little more closely. The Washington Free Beacon posted a story today about the latest numbers from the Bureau of Labor Statistics. Their reporter does a good job of putting the numbers in context. There were 94,609,000 Americans not participating in the labor force in October, an increase of 425,000 people from the previous month, according to data released by the Bureau of Labor Statistics on Friday. The labor force participation rate, which is the percentage of the population that has a job or actively looked for one in the past month, declined from 62.9 percent in September to 62.8 percent in October. The unemployment rate for all Americans declined to 4.9 percent from 5.0 percent in the previous month. This measure does not account for those individuals who have dropped out of the labor force and simply measures the percent of those who did not have a job but actively sought one over the month. The economic recovery under President Obama has been very weak. This is America under President Obama. President Hillary Clinton will bring more of the same. I would like to note that the people cramming Common Core down our throats are not helping the shortage of qualified workers. Standardized test scores of American students under Common Core have gone down–not up. It is time to clean the swamp in Washington and begin again.